I’m not shy about admitting I know nothing about Harry Potter. I was a firm Lord of the Rings fan when the Harry Potter franchise started to take over the world, and as a matter of principle (and adolescent tenacity), I neither read nor watched anything related to Harry Potter. 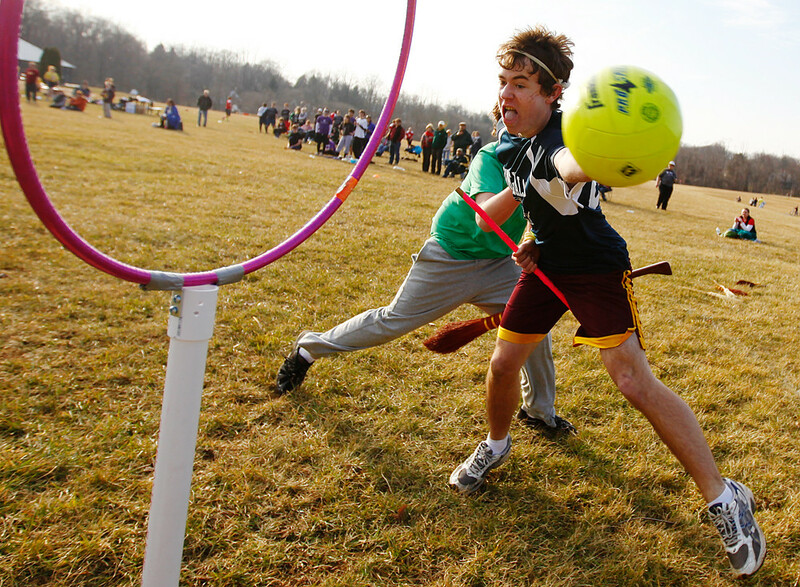 So I was at a distinct disadvantage when my editor assigned me to photograph the first-ever Central Pennsylvania Open Quidditch Tournament on Sunday. © 2011 by The York Dispatch. Ursuline School senior Sean Watson, of New Rochelle, N.Y., scores against Trinity High School in the Central Pennsylvania Open Quidditch Tournament on Sunday, Feb. 27, 2011, at Roof Park in New Cumberland. 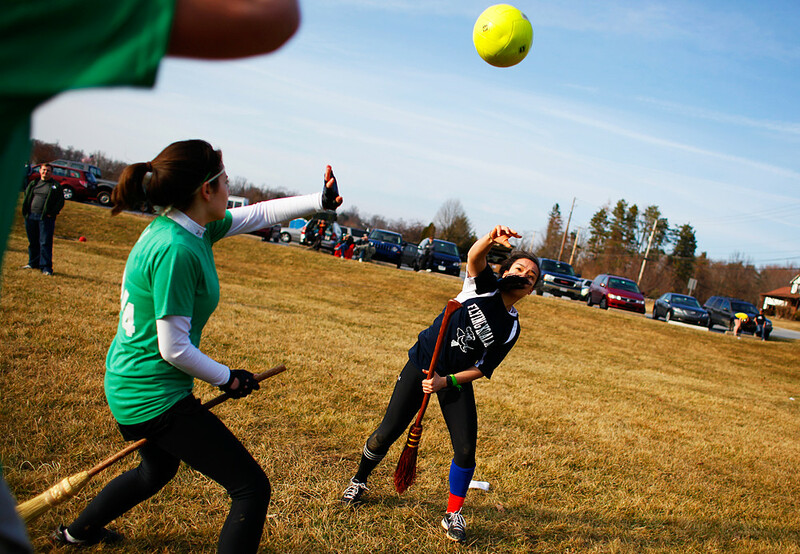 Ursuline was the only out-of-state team in central Pennsylvania's first-ever Quidditch tournament, and was also the tournament winner. © 2011 by The York Dispatch. Spare brooms lie on the ground during downtime in the first-ever Central Pennsylvania Open Quidditch Tournament on Sunday, Feb. 27, 2011, at Roof Park in New Cumberland. 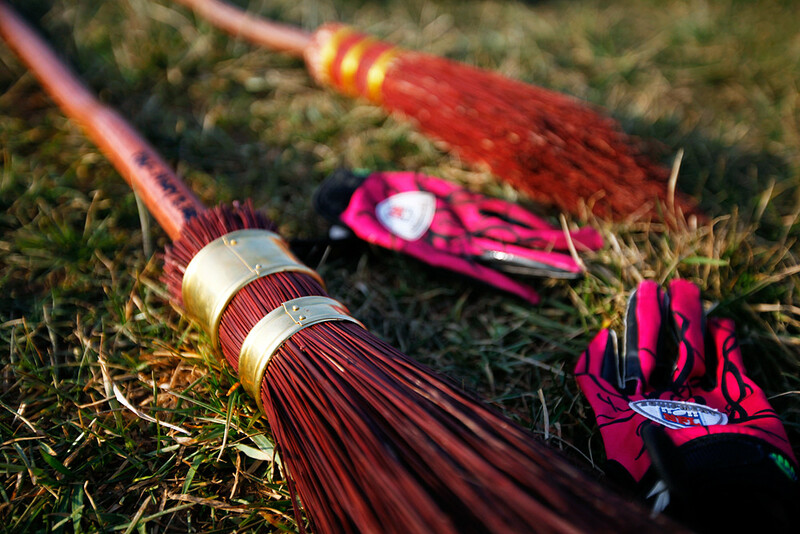 While a broom is necessary in playing Quidditch in Harry Potter's universe, the brooms for Muggles (non-witches) are of little functional use, except when the human Snitch is defending himself. Since Muggles cannot fly, these high school and college students instead ran. And tackled. It was basically a combination of rugby, dodgeball, basketball, tag and soccer. There was a thick International Quidditch Association handbook available, but the game still made no sense — but it was fun. © 2011 by The York Dispatch. Ursuline School senior Amanda Ungco passes the quaffle against Trinity High School in the Central Pennsylvania Open Quidditch Tournament on Sunday, Feb. 27, 2011, at Roof Park in New Cumberland. Last week, Daren Hidalgo was killed in Afghanistan. 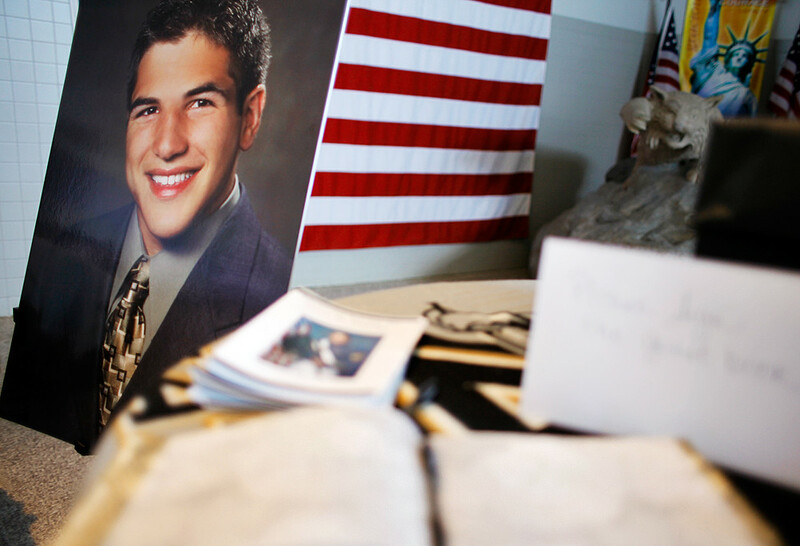 Today, his friends and the Dallastown community gathered to honor his memory. © 2011 by The York Dispatch. 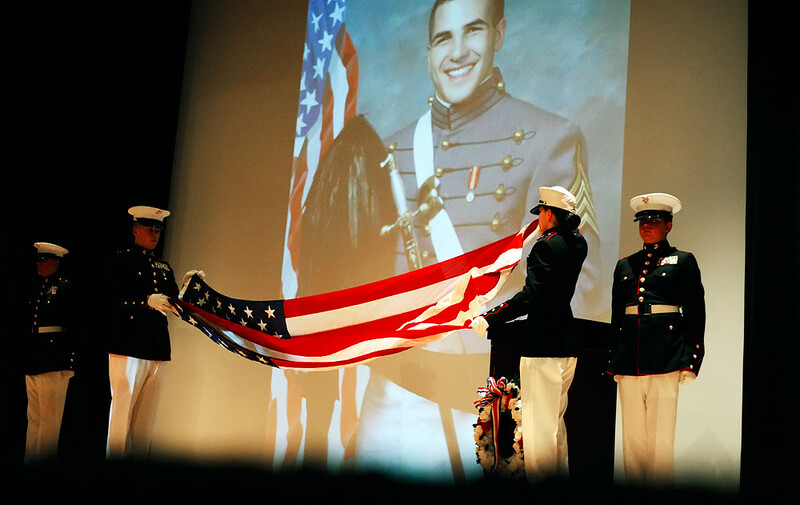 A memorial service was held Sunday, Feb. 27, at Dallastown Area High School to honor Army First Lt. Daren Hidalgo, who graduated from the school in 2005 and was killed in action in Afghanistan on Sunday, Feb. 20. 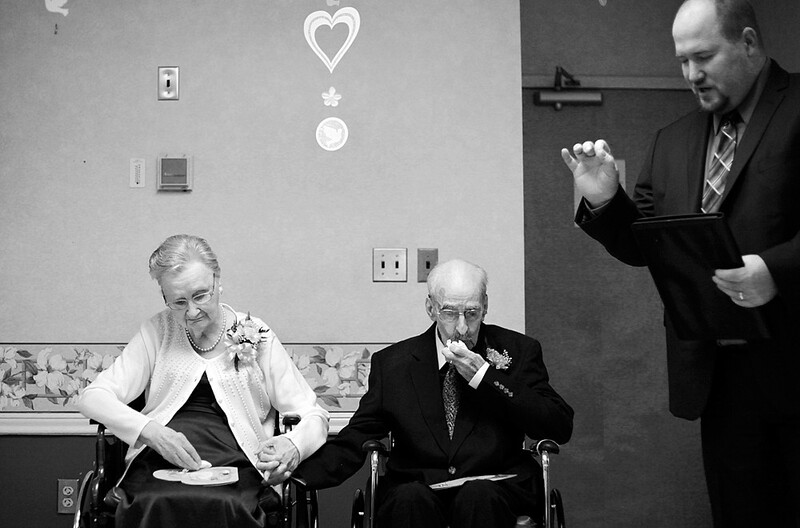 Photographing this service was difficult for several reasons. First, I felt like a jerk walking around with a camera while people were grieving, so I did my best to exercise the utmost discretion. Second, I initially didn’t know if his family would be attending (they weren’t — they’re in Wisconsin). Third, I didn’t know who among the hundreds of attendees were the ones who knew him best and were most affected by his death… but was able to find out. After making the above picture, introducing myself to Phil and almost crying myself because of his immense grief, I then felt even more like a jerk, making camera clicks during the memorial service. © 2011 by The York Dispatch. Levi Mattas of Lewisberry and Phil Bayliss of Philadelphia smile as Ali Merrifield of York Township recalls fond memories of their classmate and friend Daren Hidalgo, during a memorial service for Hidalgo at Dallastown Area High School on Sunday, Feb. 27, 2011. The three friends were among several speakers at the service who gave witness to Hidalgo's life. Members of Hidalgo's family, who now live in Wisconsin, were not present and will hold their own service on Wednesday, March 2. © 2011 by The York Dispatch. Members of the Dallastown Area High School Junior Reserve Officers' Training Corps unfold the American flag in preparation for the playing of taps at the end of a memorial service held for Dallastown alumnus and Army First Lt. Daren Hidalgo on Sunday, Feb. 27, 2011. But it was really wonderful, seeing veterans, members of the Dallastown community and Daren’s old high school friends gather to honor his memory. For the second time in a week, I was assigned to photograph something pertaining to mechanized LEGOs. Not that I’m complaining. Anybody who knows me pretty well can tell you I love LEGOs. In fact, I’m fairly certain that for a while, my younger brother and I were at peace only when we were playing with LEGOs together. That said, I was never “into” the mechanized or robotic LEGOs — but these kids sure are. Serious props to them. © 2011 by The York Dispatch. Melissa Cook, of Spring Garden Township, makes a few suggestions to her daughter Lucy, 12, as Lucy; Isaiah Marsteller, 10 of Stewartstown; Andrew Strayer, 11 of Springettsbury Township; and two other York County 4-H youth practice on Thursday, Feb. 24, 2011, for the Maryland FIRST LEGO League Championship. 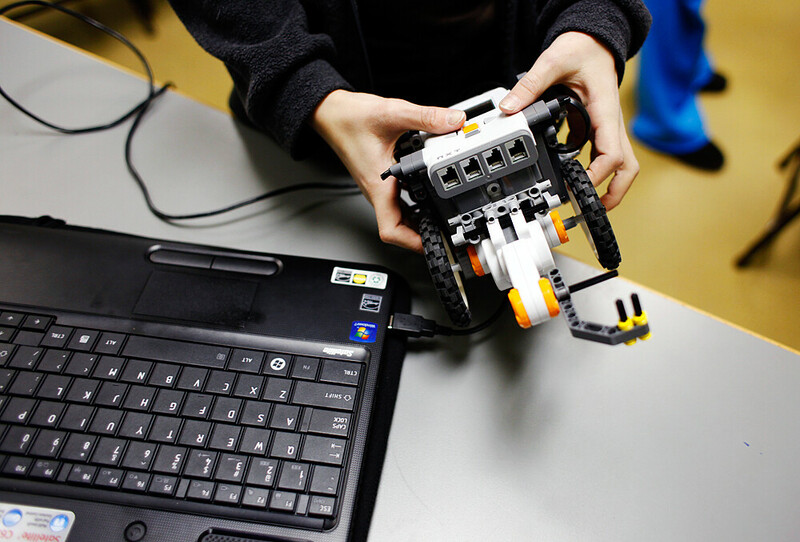 The competition -- which will feature 64 teams from Maryland, Pennsylvania and other nearby states -- required teams to research a biomedical topic and to design a LEGO robot that can perform basic biomedical tasks, such as dropping a LEGO cast onto a "broken" LEGO bone. © 2011 by The York Dispatch. 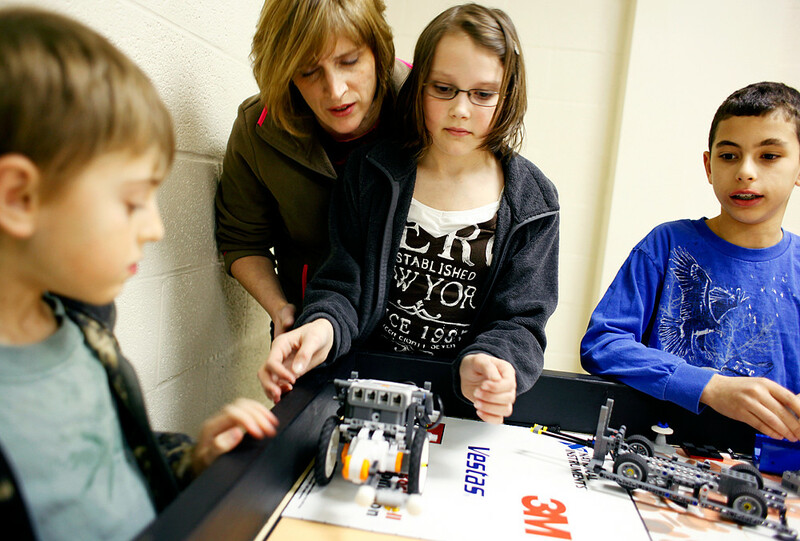 Lucy Cook, 12 of Spring Garden Township, modifies a program that she will download onto her team's LEGO robot and that will control its movements and allow it to perform tasks, on Thursday, Feb. 24, 2011. Each of the 64 teams competing in the upcoming Maryland FIRST LEGO League Championship in Baltimore had to design a unique robot that would be able to accomplish the tasks, or "missions," set forth by the competition rules. Each team is given 2 minutes and 30 seconds to get its robot to perform as many missions as possible, for points. © 2011 by The York Dispatch. 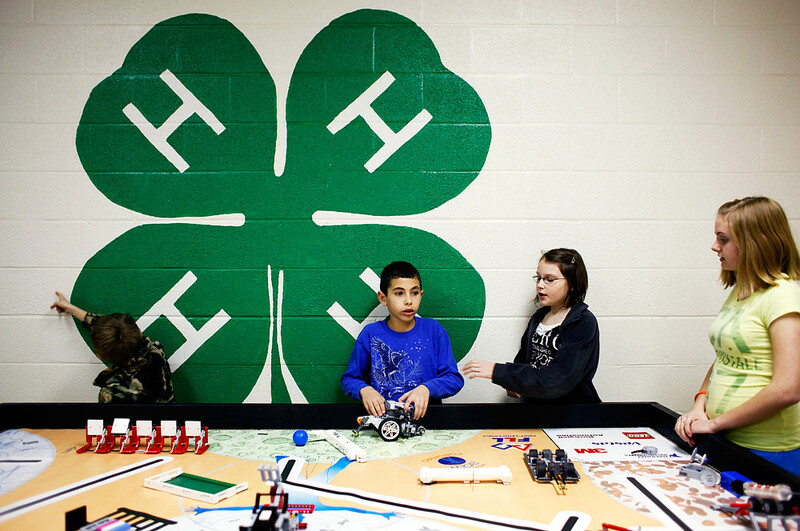 (Left to right) As Isaiah Marsteller, 10 of Stewartstown, gives in to distraction, Andrew Strayer, 11 of Springettsbury Township; Lucy Cook, 12 of Spring Garden Township; and Kirstin Fink, 13 of West Manchester Township, plot their next course of action to program their LEGO robot at the York County 4-H Center on Thursday, Feb. 24, 2011. Thursday was their last practice session to nail down at least 4 of 11 possible tasks, or "missions," for their LEGO robot to perform. Getting to travel and explore with fellow photographers is great, because a) you’re going to get better images because you’re all trying to outdo each other and b) nobody can/will/should get fed up with you if you want to linger someplace for “just a few more minutes” or pull over on the side of the road to make pictures. By the same token, getting to travel and explore with a good, old friend is great because she knows you carry your camera (and a few lenses) and will put up with your shenanigans. 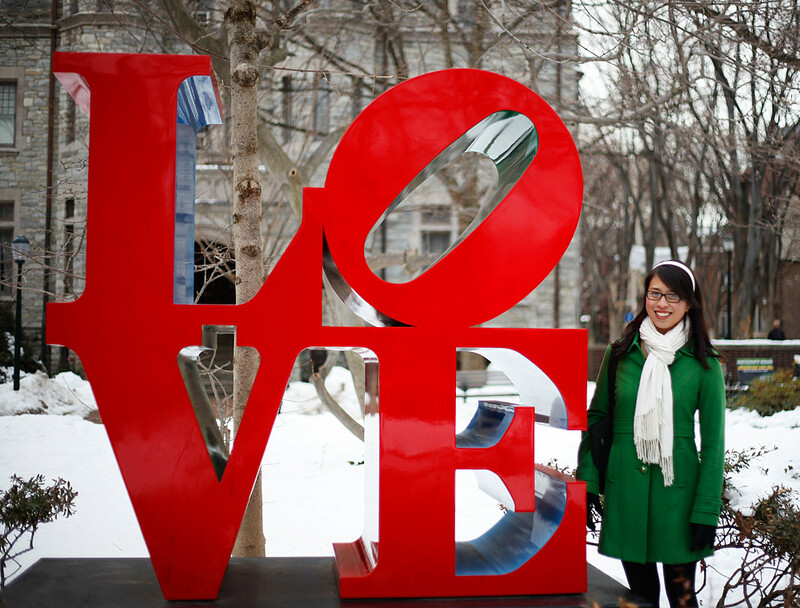 Emily, the friend whom I visited in Philadelphia earlier this month, is such a friend. We met when I was a prospective new student at St. John’s, and have been friends since our freshman year there. And she’s been putting up with my love of photography for almost that long. 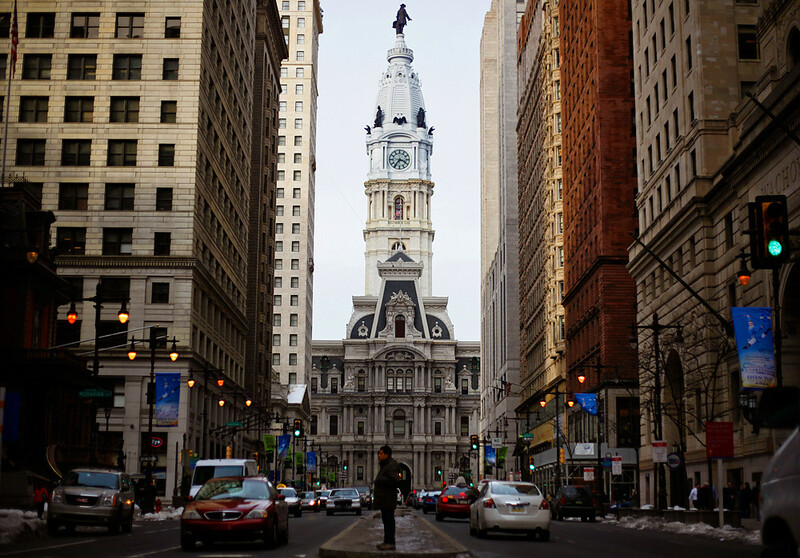 For example, we were walking west on Walnut Street when all of a sudden I saw a really spectacular building to our right. Ding-ding-ding, hell yes, I do. So we did just that. And then I turned 180 degrees and made another picture. 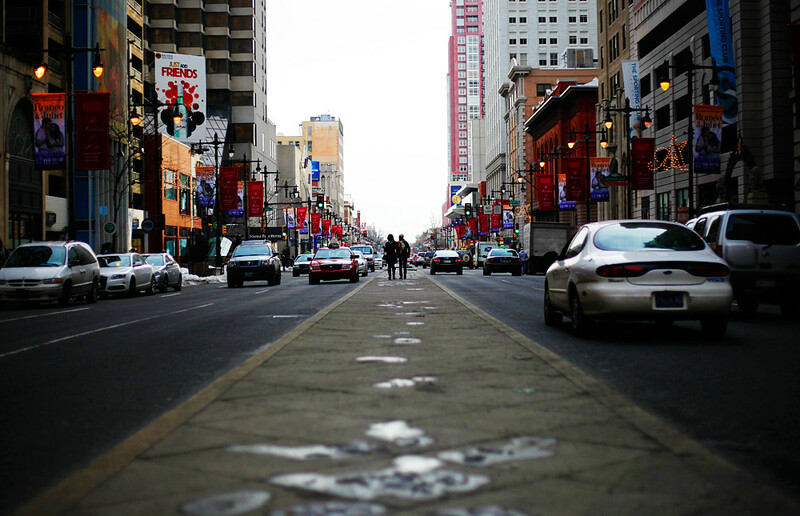 Facing south from the intersection of Walnut Street and South Broad Street in Philadelphia. Then we continued on our way, back to the UPenn campus (where Emily is in her last year), and I made a few more pictures. And Emily was still patient with me. 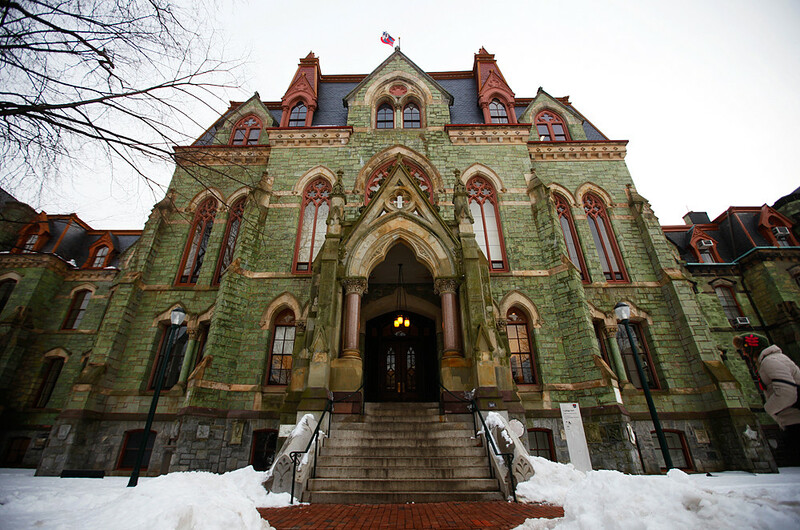 College Hall on the UPenn campus. Thanks for a really great 27 hours in Philadelphia, Emily! Yesterday, I went to City Hall to photograph a few Crispus Attucks Youthbuild Charter School students see their artwork on display there. They’d taken only two classes so far, and completed charcoal portraits of famous black Americans in history. © 2011 by The York Dispatch. 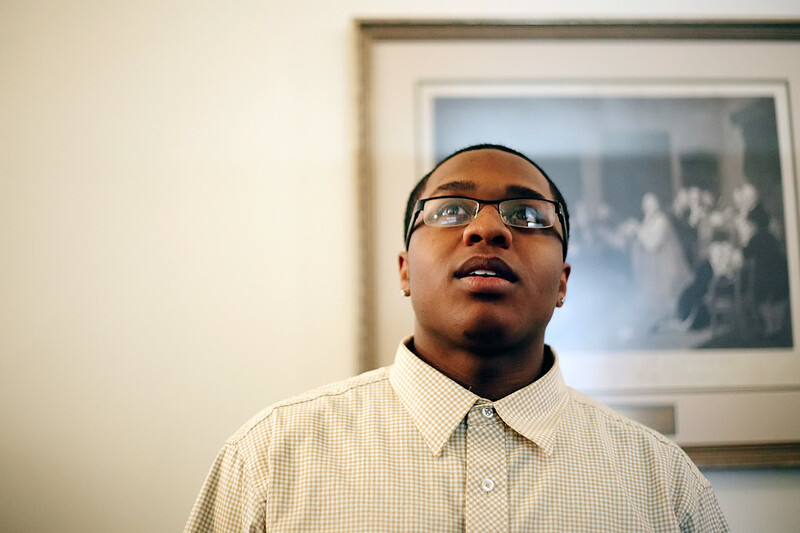 Crispus Attucks Youthbuild Charter School senior Isiah Jones, of York City, gazes at the charcoal portrait of York City mayor Kim Bracey that he drew, in City Hall on Wednesday, Feb. 23, 2011. Jones and several other students participated in two classes hosted by the York Art Association to learn about portraiture and draw portraits of famous blacks in American history. Jones said he had never done art before but was pleased with his portrait of the mayor, which won second place in a York Daily Record poll. 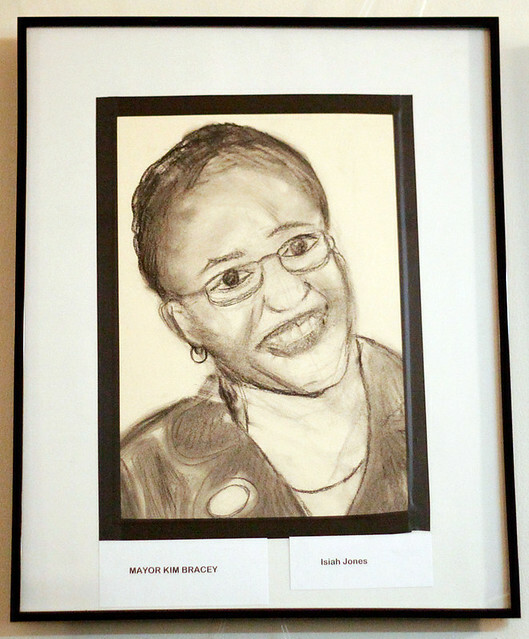 One student — Isiah Jones — chose to depict York City’s own mayor Kim Bracey. © 2011 by The York Dispatch. Crispus Attucks Youthbuild Charter School senior Isiah Jones' second-place charcoal portrait of York City mayor Kim Bracey is on display in City Hall, among other portraits of famous black Americans in history. And watching him see his art again — and getting recognized for it — was incredible. I’ve encountered so many students, here and elsewhere, who have been blasé, indifferent or even flippant about their own artwork and talent. But Isiah, who said this was his first foray into art, was proud of what he’d accomplished — and yet humble, too. © 2011 by The York Dispatch. 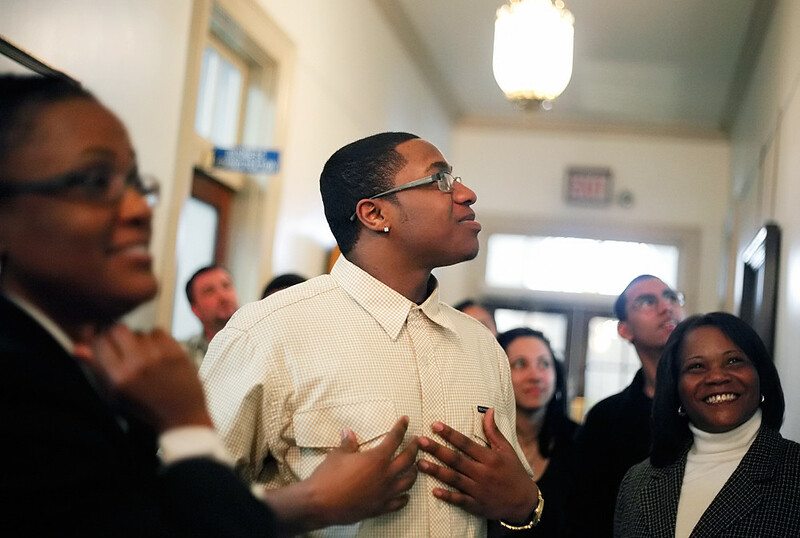 Crispus Attucks Youthbuild Charter School senior Isiah Jones relishes the moment after hearing his portrait won second place in a York Daily Record poll, in City Hall on Wednesday, Feb. 23, 2011. That was really neat to see. Last night, I shot my first doubleheader. It was also the first time I’d shot college basketball in about a year, and — despite the facts that this is not Division I basketball and that I’ve covered a lot of high school basketball — I felt out of practice. © 2011 by The York Dispatch. York College's Aja Wallpher tries to work around St. Mary's Jasmine Jones' and Taylor Petrisko's defense in the second half of the first game in the Capital Athletic Conference Women's Basketball Tournament at York College on Tuesday, Feb. 22, 2011. 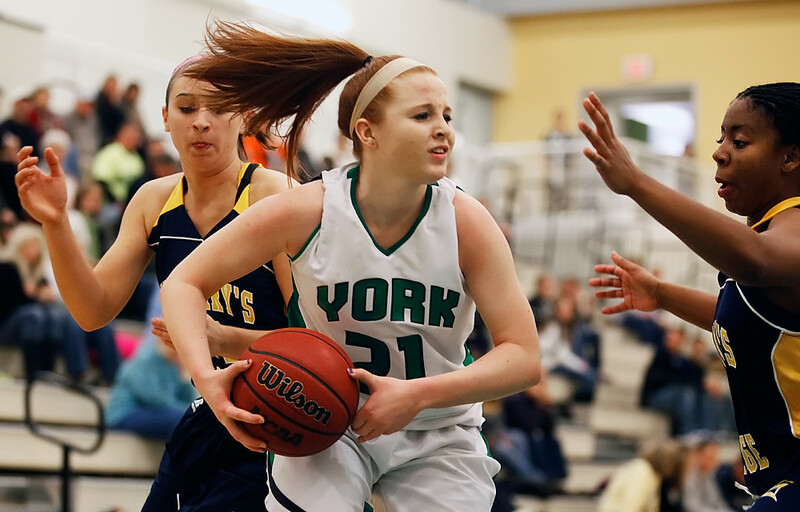 York College defeated St. Mary's 74-61 and will continue to the tournament's second-round game against Marymount on Thursday, Feb. 24. Also: I haven’t really had a problem with referees getting in my way at high school games, but that was definitely an issue with both games I shot last night, no matter where I moved or sat. © 2011 by The York Dispatch. York College's Julian Watson drives the ball against Salisbury's Justin Taylor during the first-round game of the Capital Athletic Conference Men's Basketball Tournament at York College on Tuesday, Feb. 22, 2011. 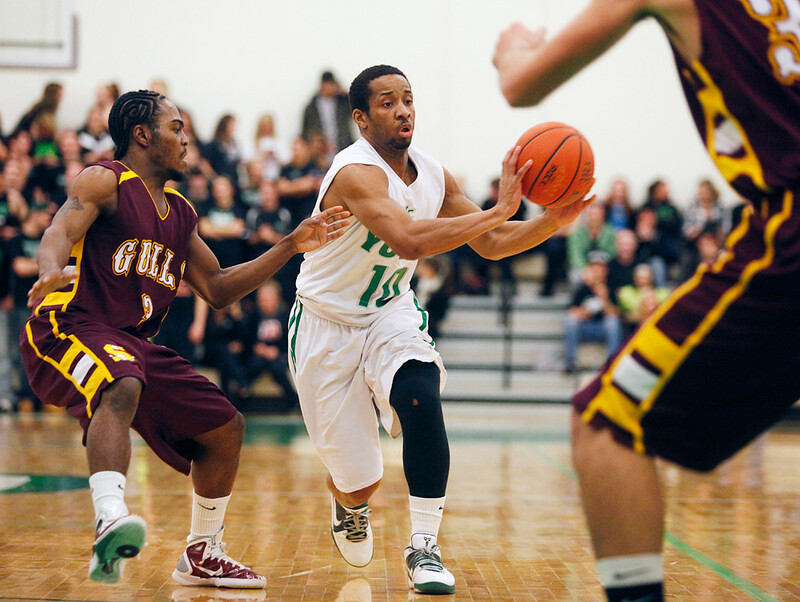 After tying 2-2 early in the first half, York College never gained the lead over Salisbury and lost 77-64. Then again, my custom for high school games was to sit right under and behind the basket — where refs never go — whereas for these games, I made a point not to do so, to alleviate my backfocusing issues. As it turned out, backfocusing wasn’t such a big problem last night, but I know I missed a lot of great shots and great emotions because of the refs. Long story short? I can’t win. © 2011 by The York Dispatch. 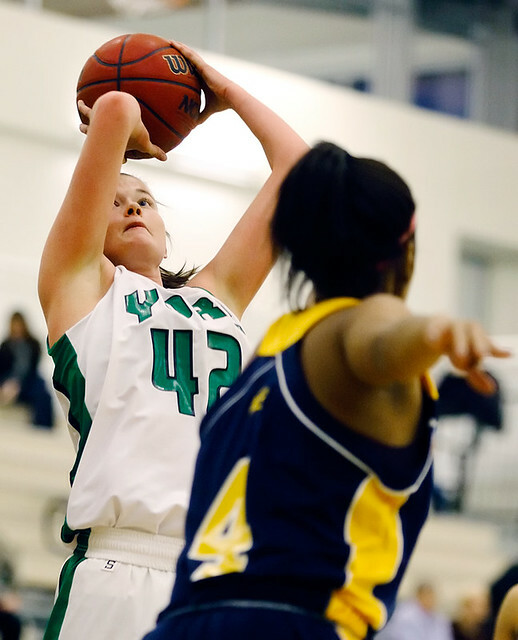 York College's Jaimie Sapp shoots against St. Mary's in the first half of the first game in the Capital Athletic Conference Women's Basketball Tournament at York College on Tuesday, Feb. 22, 2011. But dammit, I’ll keep working and trying. 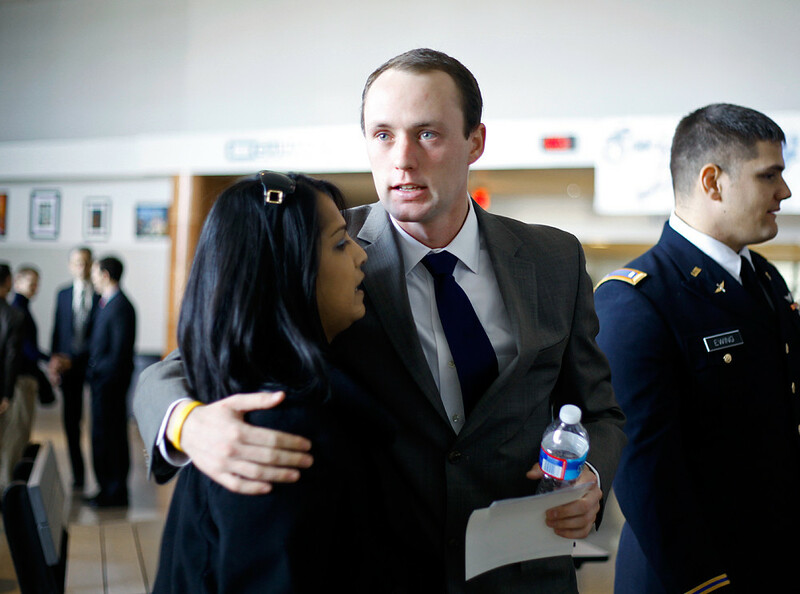 A young man — one year older than I — was killed in Afghanistan on Sunday. © 2011 by The York Dispatch. 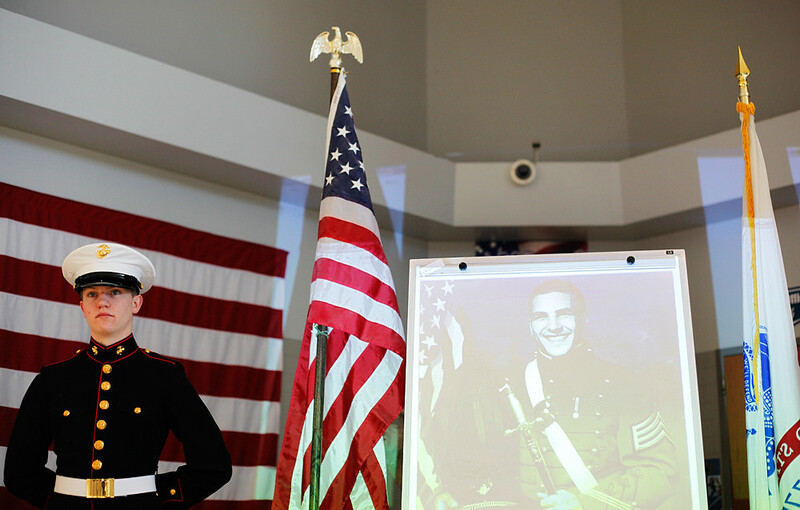 Nicholas Horrocks, a Dallastown Area High School senior and cadet gunnery sergeant in the Junior Reserve Officers' Training Corps, stands as part of an honor guard in Army First Lt. and Dallastown alumnus Daren Hidalgo's memory in the school lobby on Wednesday, Feb. 23, 2011. Hidalgo, who graduated from Dallastown in 2005, was killed Sunday in Afghanistan while in combat operations. Members of the Dallastown JROTC will rotate shifts in the honor guard next to a projected portrait of Hidalgo throughout the rest of the day. Although Daren Hidalgo graduated from Dallastown before the school began its JROTC program, five JROTC officers are standing on honor guard duty for him today. © 2011 by The York Dispatch. (Left to right) Dallastown JROTC Sgt. Major Dakota Richardson, Cadet Gunnery Sgt. 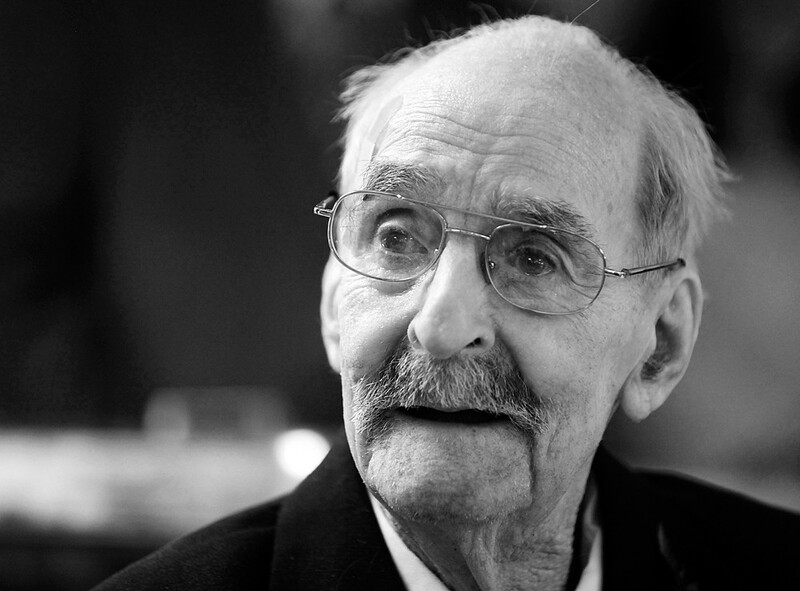 Nicholas Horrocks and Cadet First Sgt. 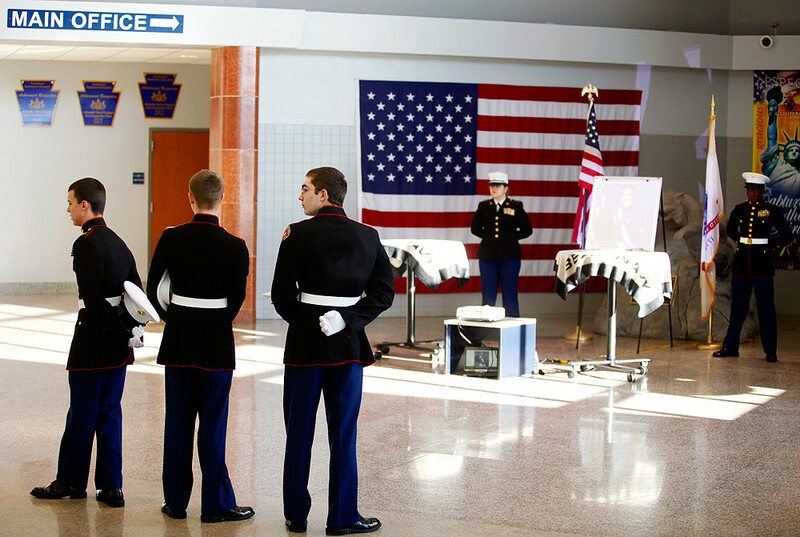 Colt Eppley -- all Dallastown Area High School seniors -- stand in the school lobby waiting to relieve Cadet Captains Miriah Miller and Kareen Plaza in an honor guard in Army First Lt. Daren Hidalgo's memory on Wednesday, Feb. 23, 2011. © 2011 by The York Dispatch. 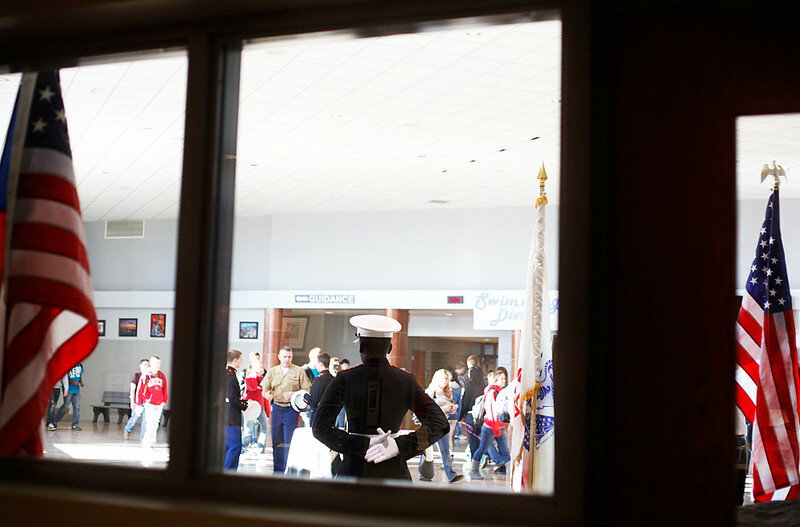 Kareen Plaza, a Dallastown Area High School senior and cadet captain in the Junior Reserve Officers' Training Corps, stands as part of an honor guard in Army First Lt. and Dallastown alumnus Daren Hidalgo's memory in the school lobby on Wednesday, Feb. 23, 2011. 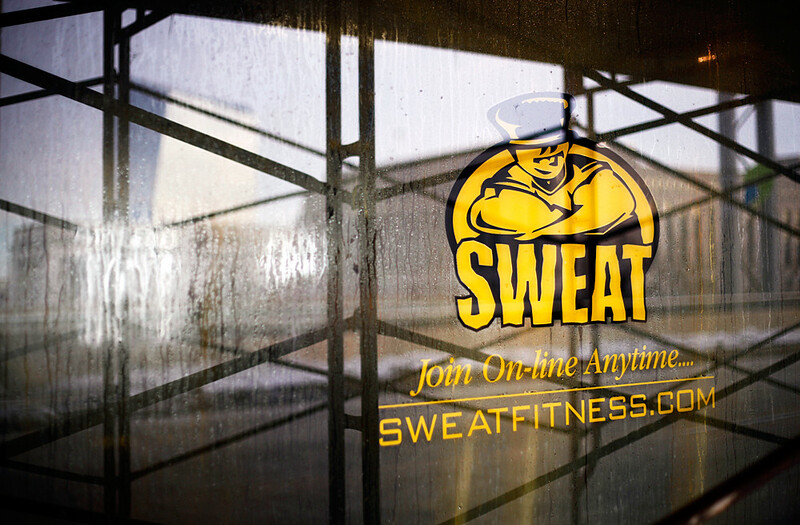 Window condensation in a gym on Walnut Street, going west toward the Walnut Street Bridge. …And water under the bridge. View from the Walnut Street Bridge in Philadelphia. I’ll soon blog one more Philadelphia post. For the first time in my life, I wiped out on the ice last Thursday. Minus a buzzing headache, an aching elbow and a sore back, I brushed it aside. Then my 16-35/2.8 lens — which had been attached to my camera and had remained in my bag during my fall — came off my camera only after a struggle. The lens is at Canon now and should be repaired soon. In the meantime, because I no longer have a wide lens for my own camera, I’m using the intern kit’s D2H with the 17-35/2.8. © 2011 by The York Dispatch. 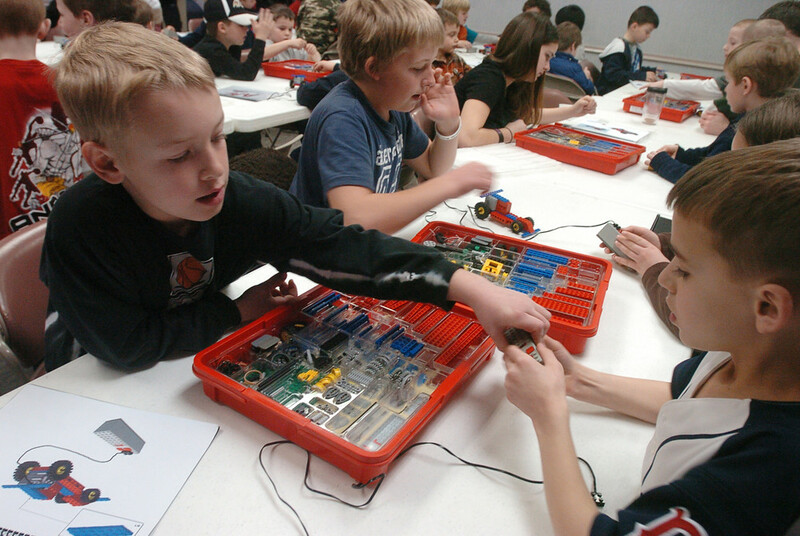 Marc Johnson, 9 of Penn Township, Lancaster County, reaches across the table to help his cousin Brady Pratte, 7 of Springettsbury Township, construct a motorized LEGO race car on Monday, Feb. 21, 2011, at the York Jewish Community Center. Kids of all ages could register to build motorized LEGO race cars out of custom kits on Monday, Feb. 21, 2011, at the York Jewish Community Center. The sessions were sponsored by All About Learning, an organization that encourages kids to learn about math and science via hands-on interaction. …And using a cropped sensor again for the first time in months is reminding me why I went full-frame. Anyway, having realized that I should have a backup lens in the event of my very important wide-angle zoom going out, I’ve ordered a wide prime that should arrive on Thursday. In the meantime, I’m shooting midrange and telephoto on my own camera. © 2011 by The York Dispatch. Taylor Pratte, 9 of Springettsbury Township, tests out her completed motorized LEGO race car in a hallway at the York Jewish Community Center on Monday, Feb. 21, 2011. 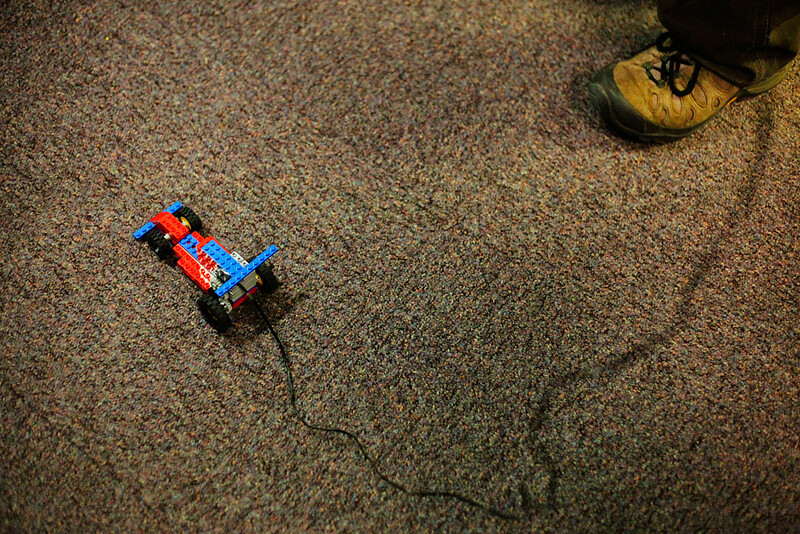 The race cars were one of several motorized LEGO vehicles the kids could construct from custom kits. Which means I’m shooting with both Nikon and Canon — at least until Thursday — for the first time since Dec. 2009, when I shot the Texas Bowl game. Which is always an interesting experience. I guess I can’t complain about being kept on my toes. Here’re a few photos from the past several weeks that I never blogged. I think every now and again, I’ll just post “Vignettes” entries that include single photos whose captions and content need no further commentary from me. © 2011 by The York Dispatch. 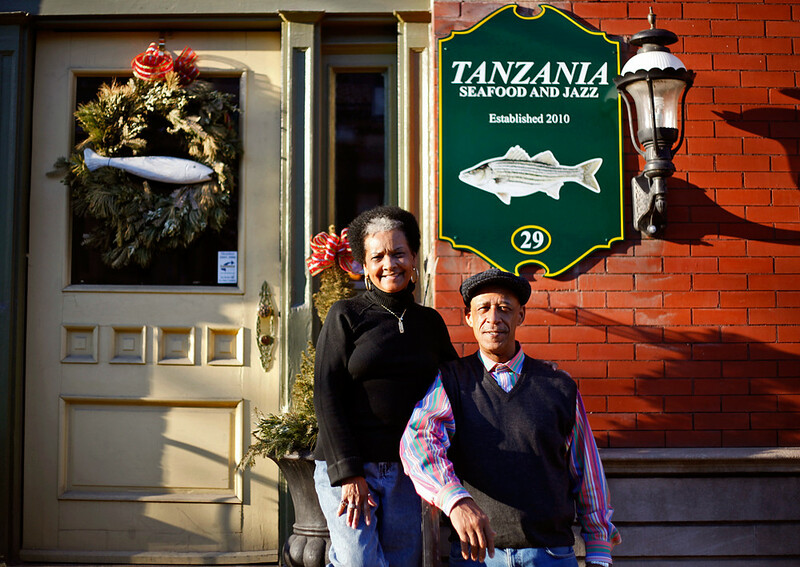 Kerry and Juanita Kirkland are opening a new restaurant, Tanzania Seafood & Jazz, on Thursday, Feb. 3, 2011. The restaurant, located at 29 East Princess Street, will be open 5-11 p.m. on Thursdays through Saturdays. © 2011 by The York Dispatch. York College junior Kate Estes removes old tags from donated dresses in the Junior League of York office on Tuesday, Feb. 8, 2011. York College's Public Relations Student Society of America (PRSSA) and the Junior League of York are teaming up for their annual spring dress sale at the former DEB store in West Manchester Mall. The sale opened last weekend and will be open again 4-8 p.m. on Feb. 18 and 10 a.m. - 3 p.m. on Feb. 19. Most dresses will be under $50, and customers who bring student IDs will receive a 15 percent discount. Members of the public can donate their lightly used formal wear, accessories, shoes and gowns whenever the sale is open; donations are tax-deductible. © 2011 by The York Dispatch. 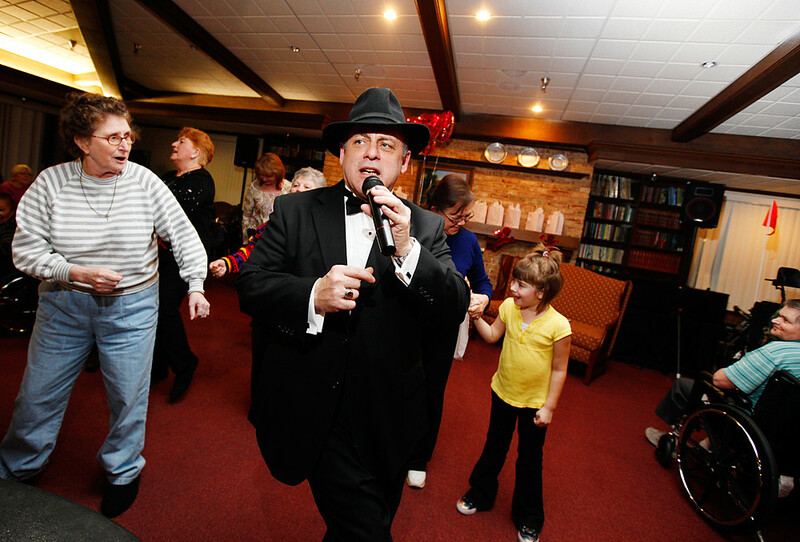 With the help of a volunteer chorus line, James Young, a Frank Sinatra impersonator from Lancaster City, sings "New York, New York" at a "Sweet Evening" event hosted by Colonial Manor Nursing and Rehabilitation Center for its residents and their families on Thursday, Feb. 10, 2011. The event also featured finger-food items and a chocolate fountain. My 27 hours in Philadelphia ended gray, dreary and misty-rainy, and they began windy and cold — but also sunny. 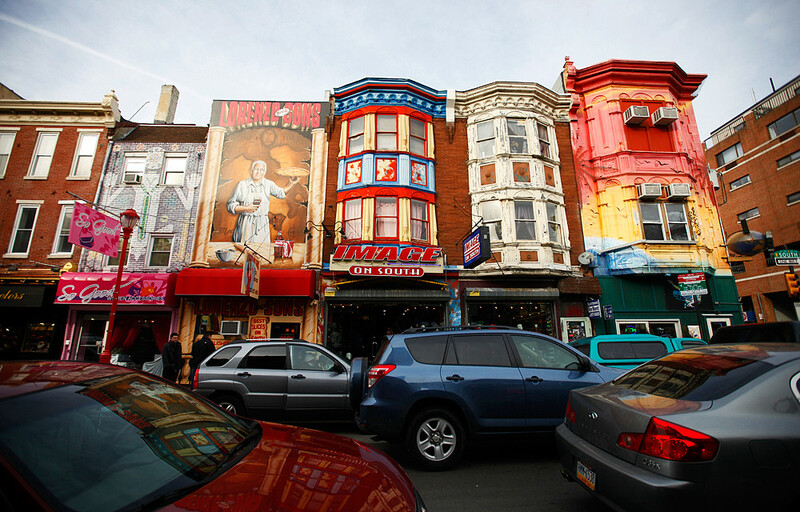 A colorful row of houses and storefronts on South Street near South Third Street. 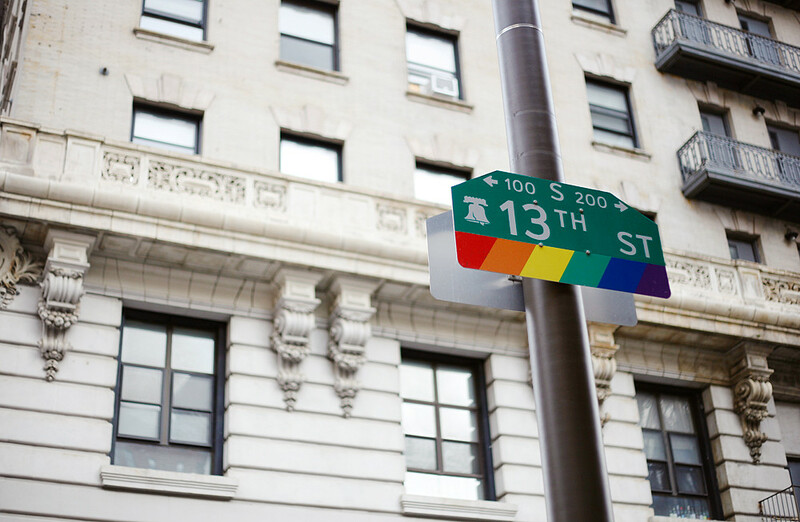 Walnut Street and 13th Street. As an avid fan of jumping photos, I’m excited that I’ve now taken yet another one… for a York Dispatch assignment… and it ran on today’s front page. © 2011 by The York Dispatch. Penn State York sophomores Angi Solle and Sam Noerpel are excited to be the campus's two designated dancers for the 39th annual Penn State IFC/Panhellenic Dance Marathon (THON), which will require them to stay up for 46 hours on Feb. 18-20 in the Bryce Jordan Center without sleeping, sitting or imbibing caffeine. THON is a year-round fundraiser that benefits The Four Diamonds Fund, Conquering Childhood Cancer for the Penn State Hershey Children's Hospital. 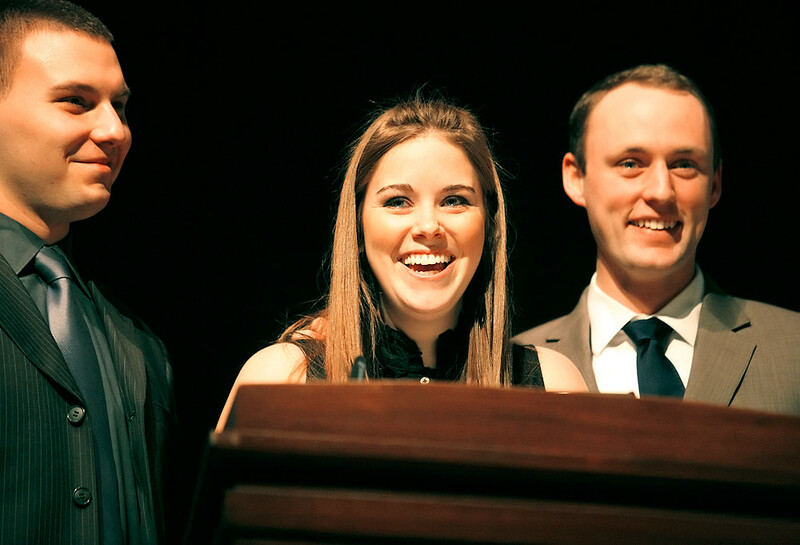 The idea behind this assignment was to show the excitement and spirit these two students have. (If they weren’t excited and spirited, they wouldn’t have been chosen to be Penn State York’s THON dancers.) What better way to show that than by jumping? Angi and Sam were jumping-photo novices, but this photo took only a few tries. I asked them to wave their arms, bend their knees and go for height and not distance — and I’d take care of the rest. I even asked them to recall to mind the cover of “High School Musical,” to help them visualize what I needed them to do. Sometimes, I really love being a newspaper photographer. The weekend before last, I drove to Philadelphia to spend 27 hours with a high school friend. I’m not sure when Emily and I last saw each other — maybe early January 2009? — but it was too long ago. We were overdue for another visit! Knowing nothing about Philadelphia, I left everything in Emily’s hands. My only requests were that we have good food — particularly cheesesteaks. At Jim's Steaks on South Street and South Fourth Street in Philadelphia. …where we ordered the same thing. It was delicious. 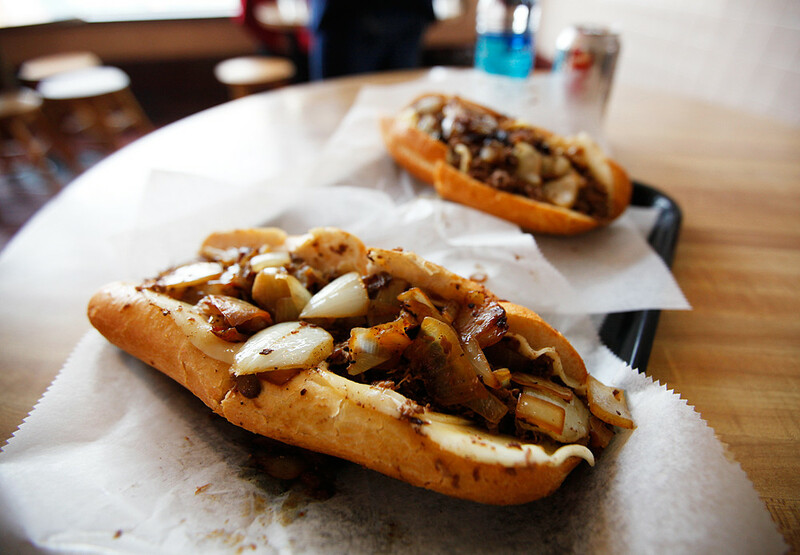 Cheesesteak with provolone and onions at Jim's Steaks. We then had frozen yogurt (with fruit and other toppings), even though it was somewhere in the 30’s and pretty windy. 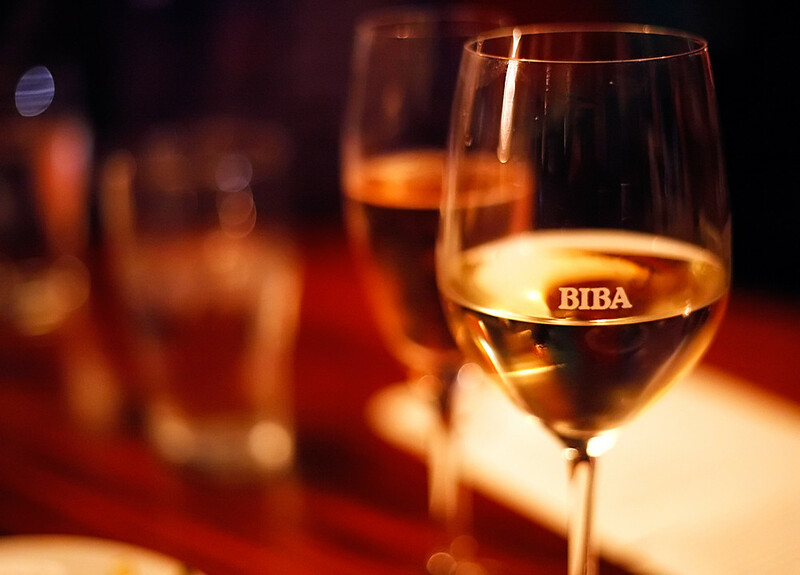 Later that night, we walked over to a small wine-cheese-beer bar called Biba. I’ve never been a cheese person, nor have I ever been able to tell a good wine. This was a Riesling with which I chose to end the night. I started out the evening with a deep, earthy red wine from Cabardès. But we struck lucky on the cheeses we chose, and I was thrilled with my wine selection. I’ve never really had a red wine I liked, so I was pleasantly surprised that I absolutely loved the Cabardès. Oh, and the food was great, too. I’d go back in a heartbeat. Wine bars are no longer establishments for me to overlook. 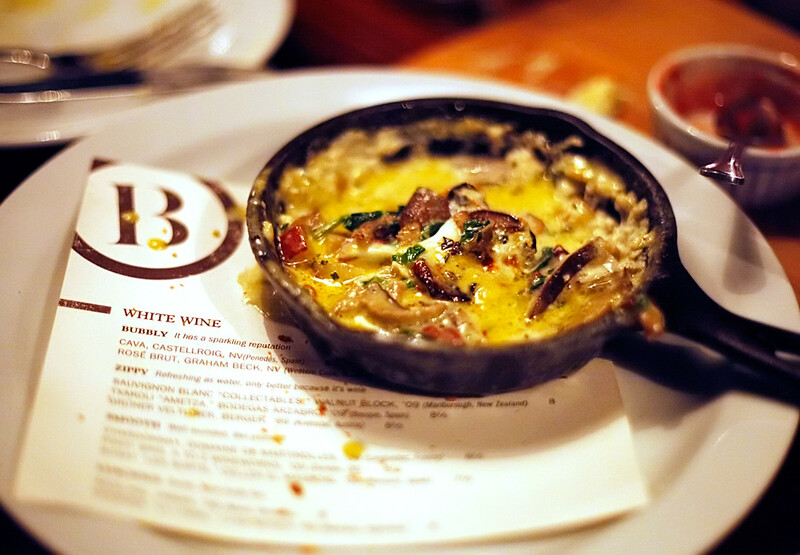 A truffled egg (served with bread). This was after we'd already partaken of some of the egg, hence the mess. More Philadelphia photos coming soon! Last week, I went to Dallastown Area Intermediate School, where one rotating unit of the gym class features Wii games and HOPSports videos. As a survivor of gym classes where I endured playing endless volleyball drills, running countless laps and embarrassing myself in tennis and badminton, I can now appreciate my coaches’ efforts to introduce us to various sports and means of athleticism. 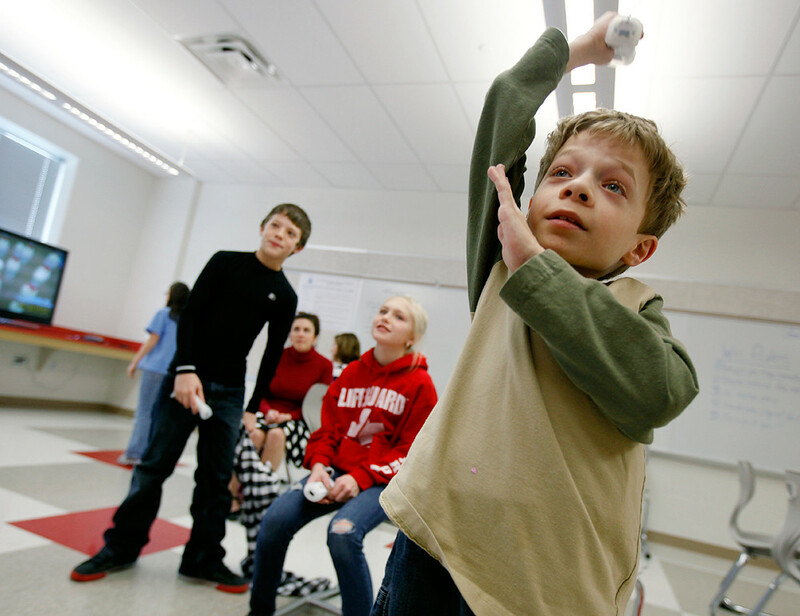 I can also see the appeal of bringing wired technology into gym class — especially if it helps kids like Quinten. © 2011 by The York Dispatch. Dallastown Area Intermediate fourth grade student Quinten Redelberger, of Dallastown, plays Wii bowling against fifth grade students Austin Wildasin of York Township and Mia Rexroth of Red Lion at school on Monday, Feb. 7, 2011. The school received funding via a state grant to install Wii and other interactive fitness technologies for use during students' physical education classes. Redelberger, who has scoliosis, said he feels motivated to exercise using the Wii program because it helps him forget his pain. Please be sure to check out the video I shot and edited, too, as it features an interview with and more information from one of the coaches. I had just put my lunch in the microwave when the newsroom got a call and my editor sent me hurrying a few blocks down to the county administrative center. Someone was getting married on Valentine’s Day! © 2011 by The York Dispatch. Douglas White places the ring on his bride Christina's finger after saying his vows in a ceremony conducted by York County Commissioner Chris Reilly on Monday, Feb. 14, 2011, at the York County Administrative Center. Reilly said that every Valentine's Day, at least one couple is married by a county official. I arrived ahead of them and, after I couldn’t find any signs of a marriage ceremony, was about to leave when I ran into the couple entering the building. Everything went smoothly from there. They almost had me sign as their witness, but a woman waiting in an office came along and volunteered. © 2011 by The York Dispatch. 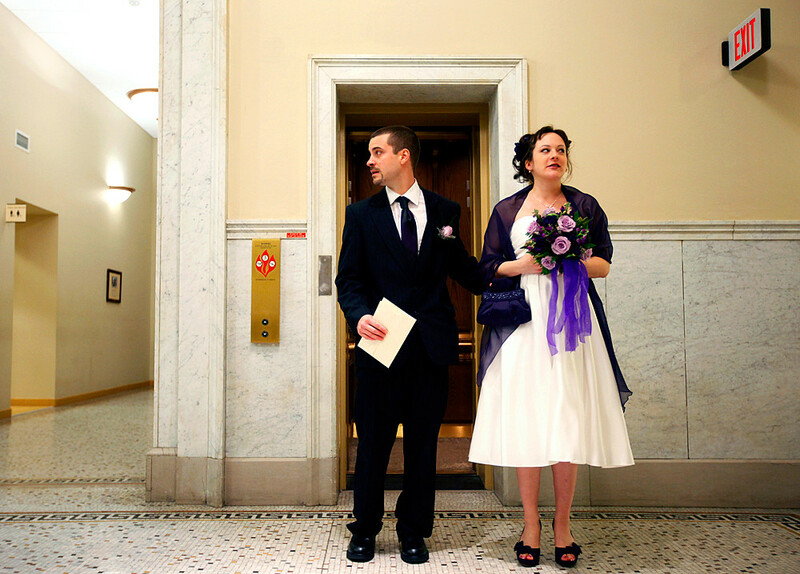 Having just arrived at the York County Administrative Center, Douglas White and Christina Case of York Township pause outside the second-floor elevator, unsure of where to meet York County Commissioner Chris Reilly on Monday, Feb. 14, 2011, for their marriage ceremony. © 2011 by The York Dispatch. Christina Case and Douglas White, of York Township, wait for York County Commissioner Chris Reilly to marry them in a quick ceremony on Monday, Feb. 14, 2011. The two have been together for about a year and decided last week to get married. "We thought, 'Why not on Valentine's Day?'" Case said. © 2011 by The York Dispatch. 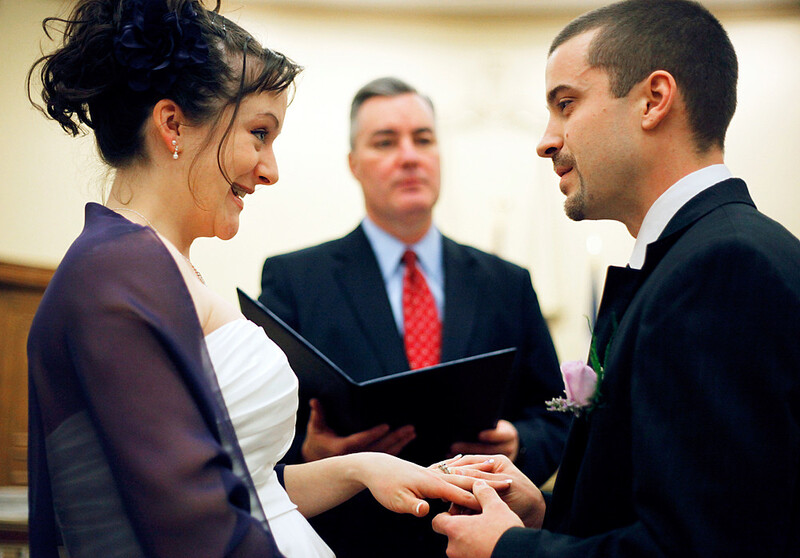 Having spoken their vows and exchanged rings, newlyweds Christina and Douglas White kiss in the York County Administrative Center on Monday, Feb. 14, 2011. The Whites decided last week to get married, and a woman waiting in a county office acted as their witness. Once again — Happy Valentine’s Day! 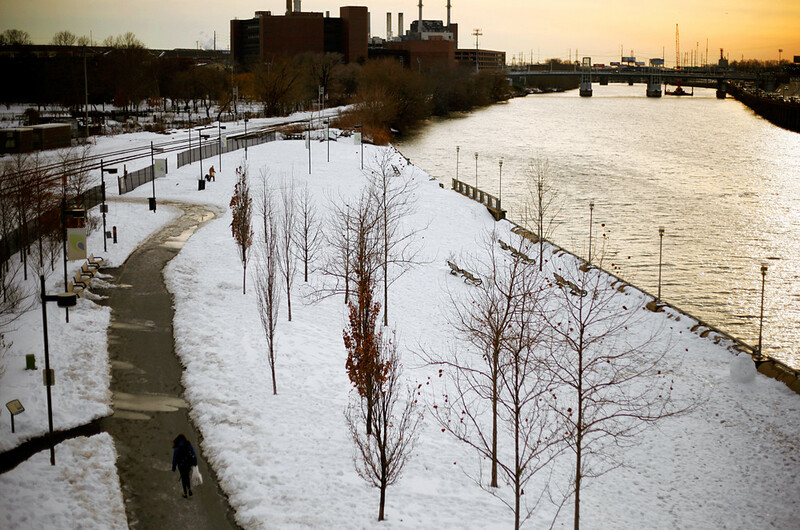 Yesterday, I had the pleasure of photographing what could have been a scene straight out of When Harry Met Sally. 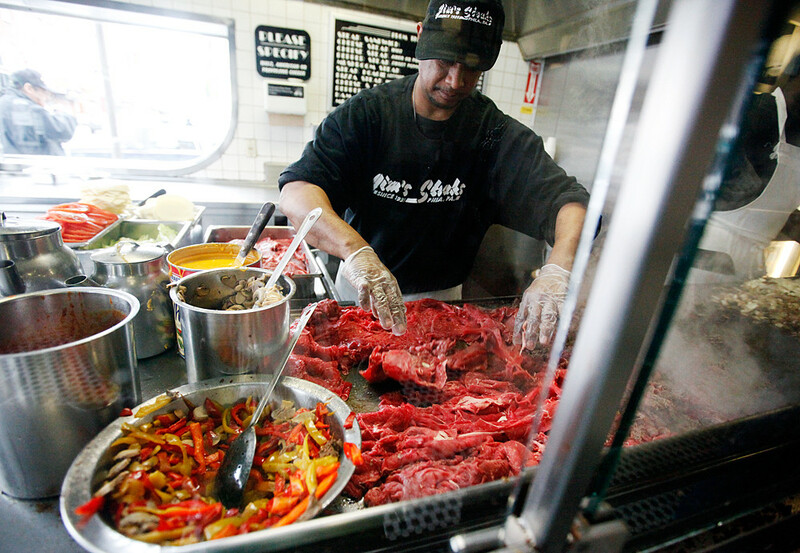 No — it wasn’t anything like the Katz’s Deli scene or Harry and Sally’s various skirmishes. 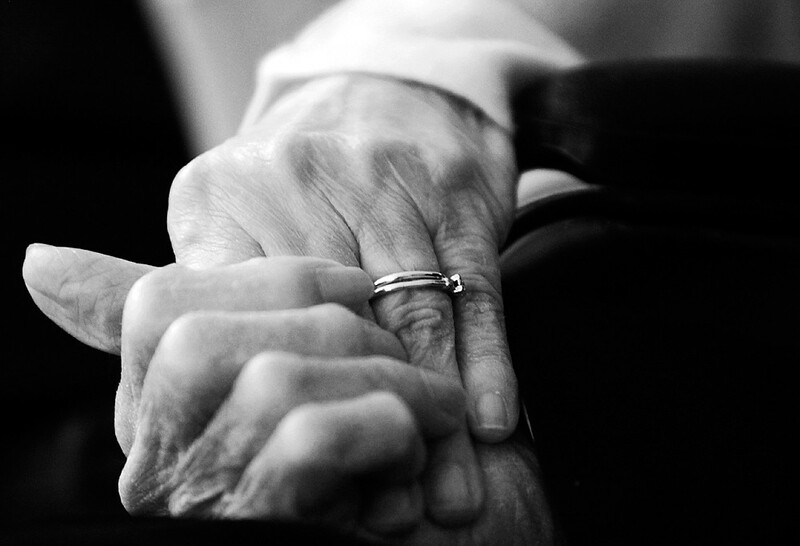 Rather, as I watched this elderly couple enter the room together and listened to them share their story with a reporter, I immediately thought of those scenes featuring older couples telling the camera how they met. Happy Valentine’s Day to all, young and old. © 2011 by The York Dispatch. 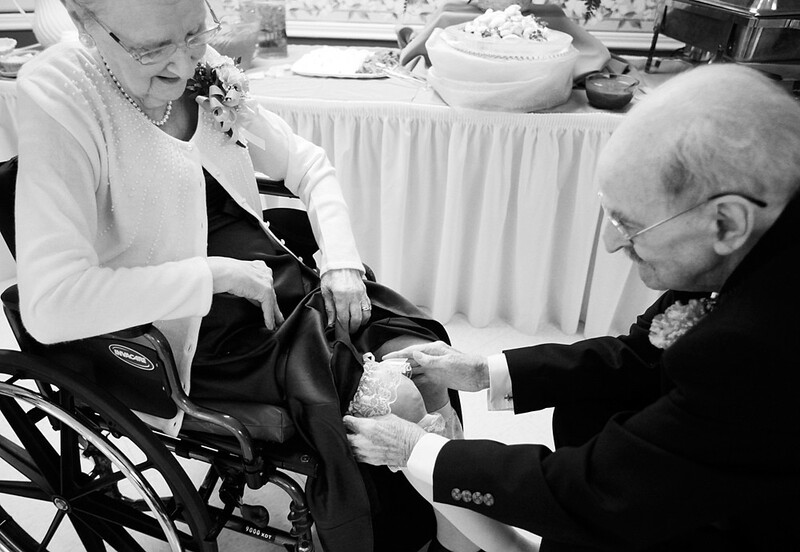 Having removed his bride Elaine's garter just over 60 years ago, James Cline places a garter back on her leg on Sunday, Feb. 13, 2011, at HCR ManorCare Dallastown where they both live. 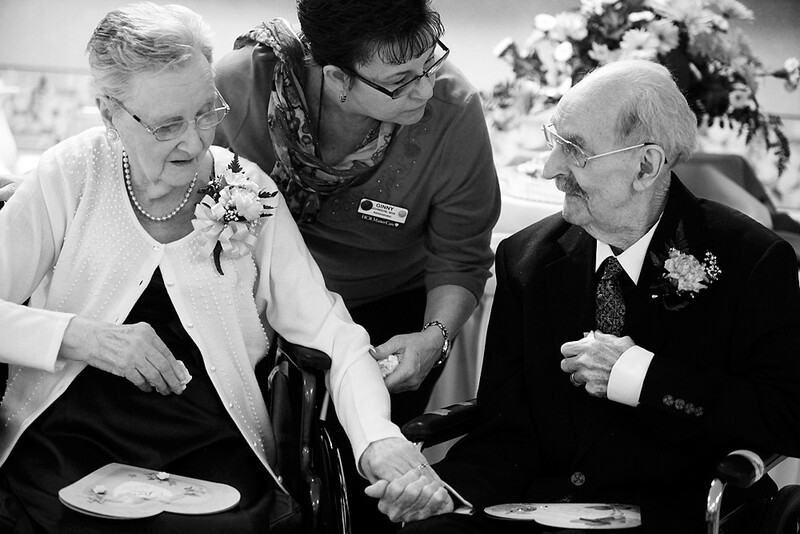 James, 90, and Elaine, 84, married 11 months after they met; James claims it was love at first sight. © 2011 by The York Dispatch. James Cline clasps his wife Elaine's hand as they watch a presentation of photos showing them throughout the years, on Sunday, Feb. 13, 2011, at HCR ManorCare Dallastown. James calls their constant hand-holding "a love transfusion." © 2011 by The York Dispatch. HCR ManorCare Dallastown administrator Ginny Johnson, center, gently tells Elaine and James Cline that they need to let go of each other's hands so their wheelchairs can be steered to another part of the dining room where they will renew their vows, on Sunday, Feb. 13, 2011. The Clines have lived at HCR ManorCare Dallastown since May 2008, and have their beds pushed together so they can hold hands as they sleep. © 2011 by The York Dispatch. James Cline tearfully gazes at his wife Elaine after they, with family and friends, viewed a presentation of photos showing the couple throughout the years, on Sunday, Feb. 13, 2011, at HCR ManorCare Dallastown. © 2011 by The York Dispatch. Elaine and James Cline listen as minister Dale Young reads from 1 Corinthians 13:4-7 before they renewed their vows on Sunday, Feb. 13, 2011, at HCR ManorCare Dallastown. The swim meet I shot on Thursday also had diving. I’ve never shot diving, and tried to make some interesting images. None of them really turned out, except one. It was a mistake — overexposed and backfocused — but I still like it. © 2011 by The York Dispatch. A Dover Area High School diver warms up before competing in a swim meet against York Suburban High School on Thursday, Feb. 10, 2011, at Dover Area Intermediate School. York Suburban's team does not include any divers. Shot swimming on Thursday, for the first time in almost exactly a year. © 2011 by The York Dispatch. Dover Area High School's Summer Dacheux swims the butterfly as the third swimmer against York Suburban High School in the 200-yard medley relay at Dover Area Intermediate School on Thursday, Feb. 10, 2011. Dacheux's lane won the event with a time of 1:58:43. They didn’t have a heat sheet — a list of all the races with all the lane assignments — available at the beginning of the meet. The York Dispatch writer told me they withhold this information so the swimmers don’t know against whom they’re competing until they’re on the diving blocks. The heat sheet that was available at the end of the meet, complete with results, didn’t have the lane assignments. Instead, the swimmers for each race were listed by how they placed. So it’s a damn good thing I only photographed the first- or second-place swimmers in each event, and took careful notes. © 2011 by The York Dispatch. 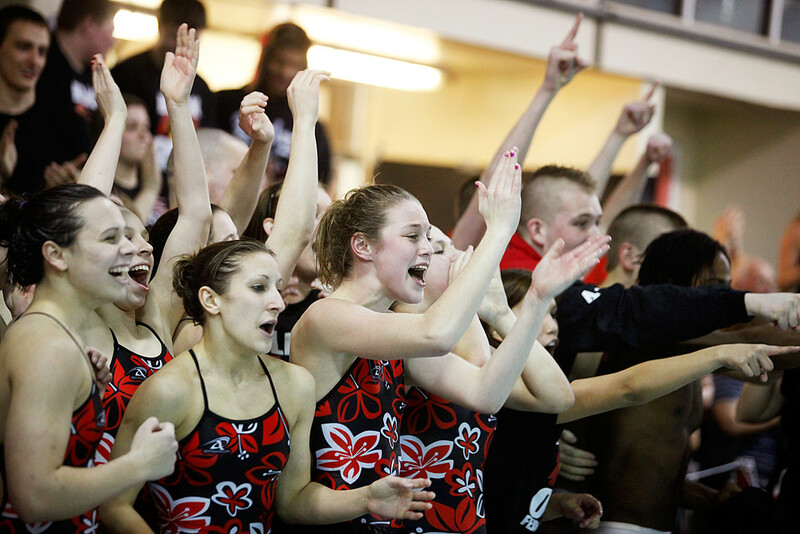 Dover Area High School swimmers cheer as fellow members win the boys 400-yard freestyle relay as the last event against York Suburban High School at Dover Area Intermediate School on Thursday, Feb. 10, 2011. 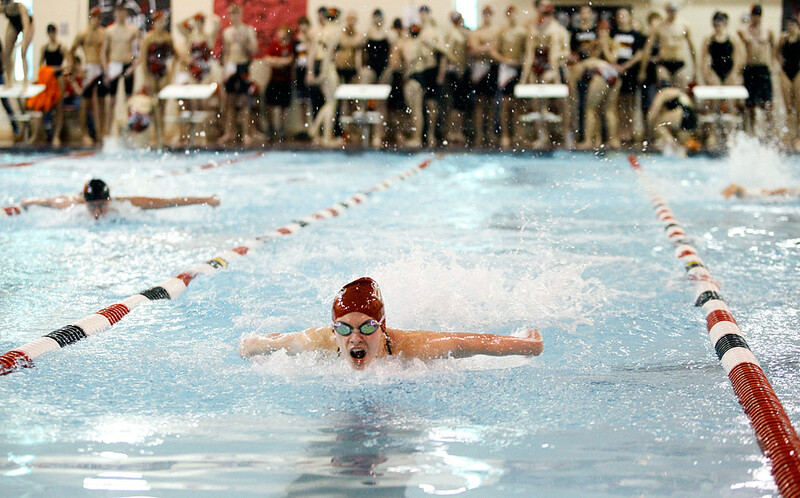 The Dover girls defeated the York Suburban girls 107-76; the Dover boys defeated the York Suburban boys 96-87. © 2011 by The York Dispatch. 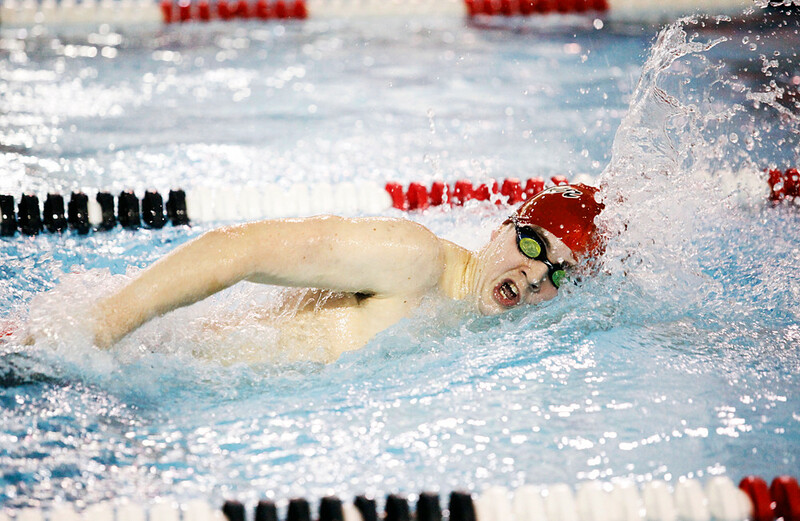 Dover Area High School's Scott Tilley swims the 200-yard freestyle against York Suburban High School at Dover Area Intermediate School on Thursday, Feb. 10, 2011. Tilley won the race with a time of 1:59:01. © 2011 by The York Dispatch. 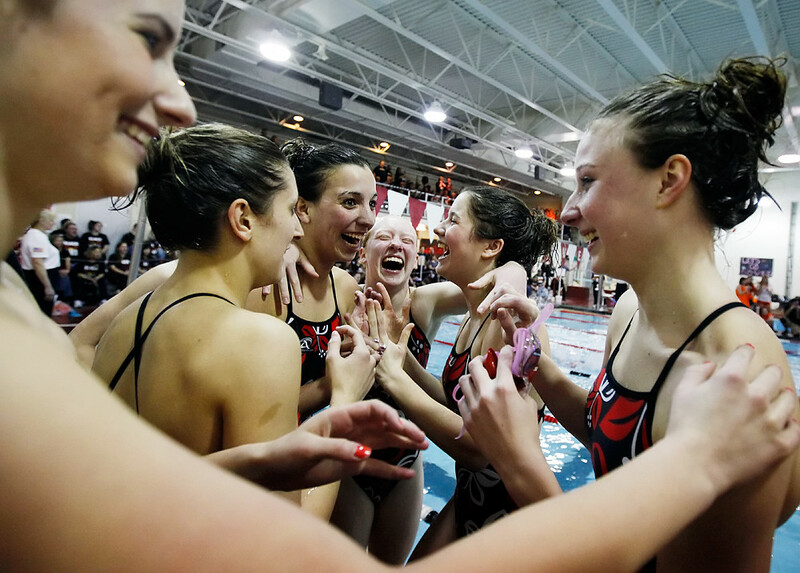 Dover Area High School swimmers congratulate fellow team members for winning the girls 400-yard freestyle relay against York Suburban High School at Dover Area Intermediate School on Thursday, Feb. 10, 2011. I shot high school basketball on Tuesday night, just as I have a few other times so far this year. And, no matter what I do or change or try, I can’t stop backfocusing. © 2011 by The York Dispatch. 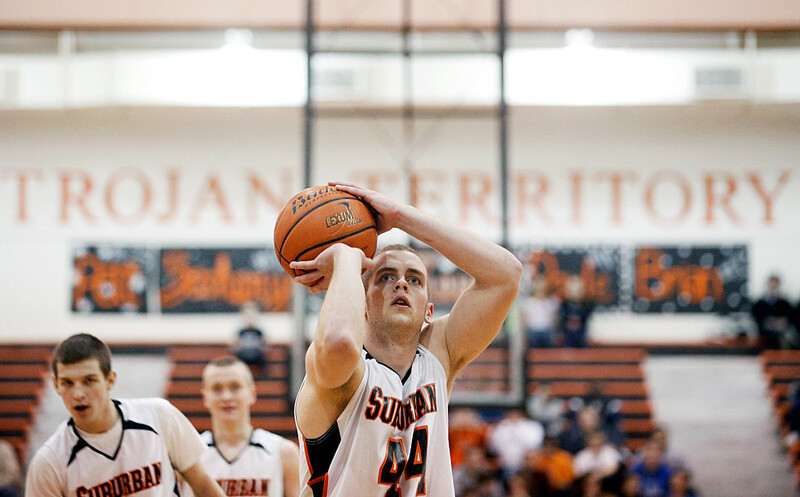 York Suburban's Kevin Donahue shoots a free-throw in the first quarter at York Suburban High School on Tuesday, Feb. 8, 2011. Donahue scored his 1,000th point in the game's third quarter. 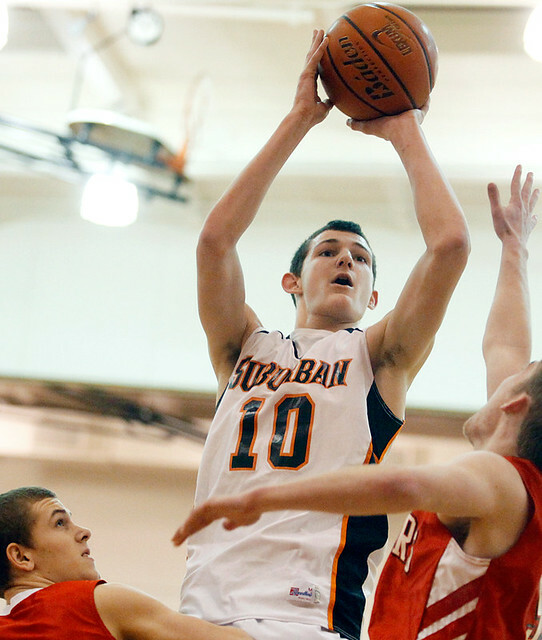 The York Suburban High School boys basketball team defeated Susquehannock High 65-41 at home. I’ve always owned a Canon, but now use a full-frame. For focusing modes, I’ve tried using AI Servo and One Shot at different games. One Shot used to work well for me when I shot with a cropped-sensor Canon. Now, neither mode is helpful in alleviating my backfocusing issues. I miss Nikon’s pro-body focus-point options, but that’s a moot point. © 2011 by The York Dispatch. 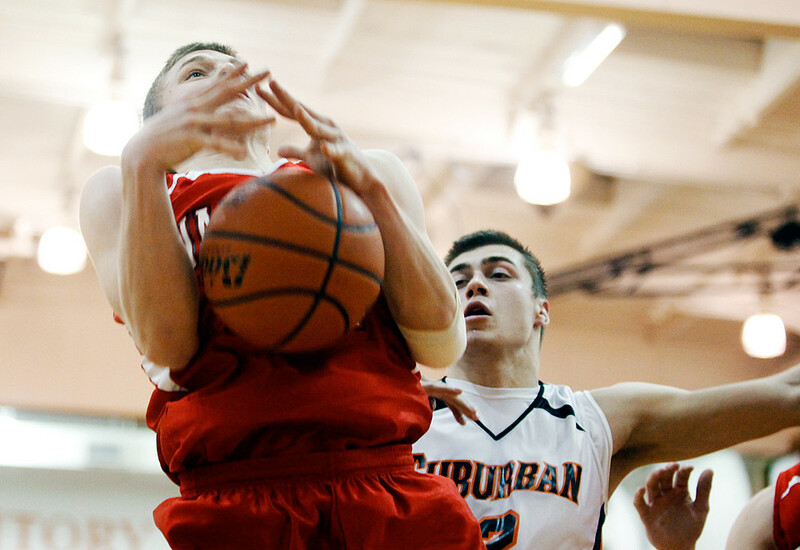 York Suburban's Ted Hinnenkamp shoots against Susquehannock High in the first quarter at York Suburban High School on Tuesday, Feb. 8, 2011. Timing and framing aren’t problems. Backfocusing is. I can’t count how many great photos I’ve had to pass because they were backfocused. And I’m not a bad basketball photographer. I’m not the best, but when I shot college basketball with a Nikon or cropped-sensor Canon, I never had any technical issues. Now, I’m shooting high school basketball with a full-frame, and I’m overwhelmed by how many awesome moments are ruined because I couldn’t focus fast enough. Gentlemen (and ladies), it’s that time of year again. © 2011 by The York Dispatch. 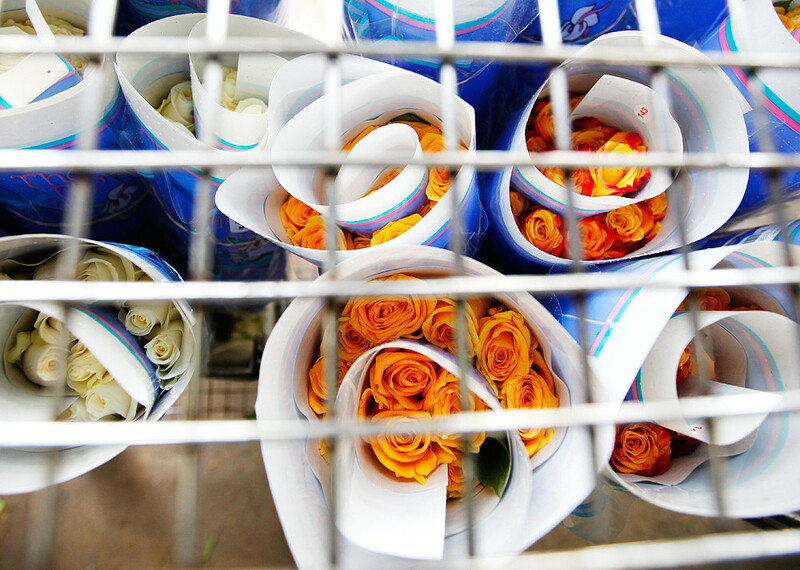 These yellow and white roses are among the 5,555 roses delivered to Royer's Flowers & Gifts on Monday, Feb. 7, 2011, in anticipation of the Valentine's Day rush. The roses, which will largely be sold in clear vases with leaf arrangements, will remain in a large trailer behind the shop until the florists begin working on more orders. © 2011 by The York Dispatch. 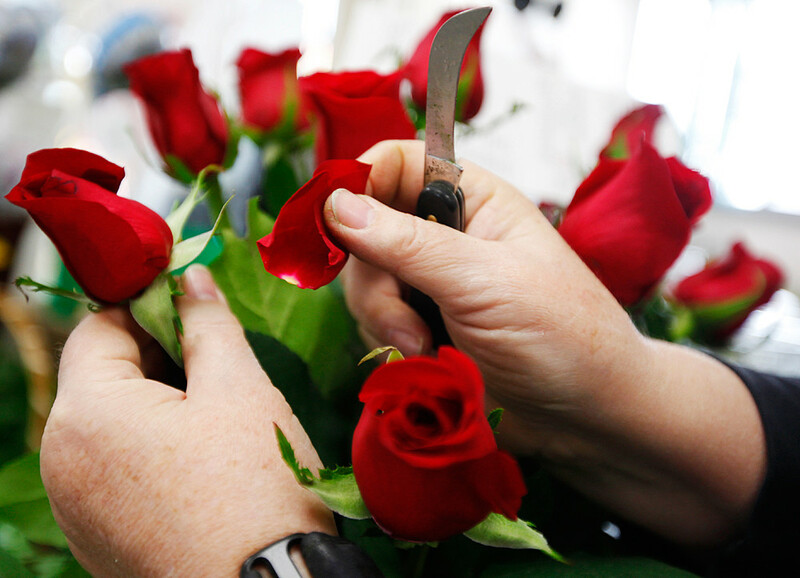 Elaine Wertman, of West Manchester Township, arranges red roses for an early Valentine's Day order at Royer's Flowers & Gifts on Monday, Feb. 7, 2011. To alleviate the Feb. 14 rush, the shop is having a special wherein customers can have flowers delivered before Valentine's Day and receive a coupon for a dozen loose roses, redeemable in the month of March. © 2011 by The York Dispatch. 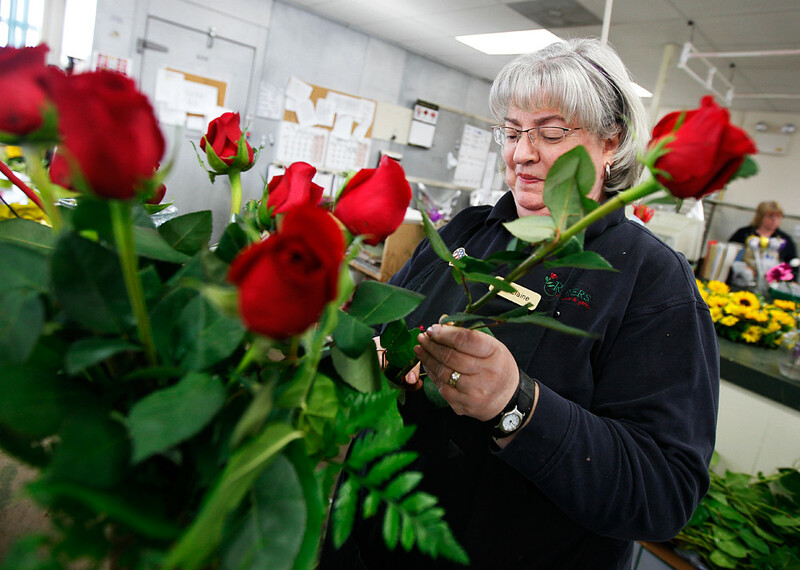 Royer's Flowers & Gifts florist Elaine Wertman, of West Manchester Township, trims some rose petals in a Valentine's Day order on Monday, Feb. 7, 2011. © 2011 by The York Dispatch. 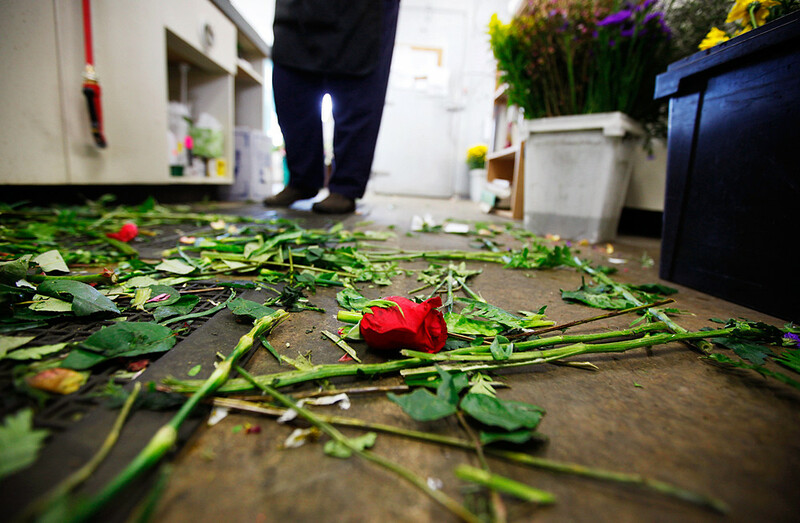 Rejected blooms and cut stalks lie on the floor of Royer's Flowers & Gifts on Monday, Feb. 7, 2011, as the shop gears up for the Valentine's Day rush.